Learn how to close the data loop to take knowledge from a big data system and apply this knowledge online to the real-time decision engine. 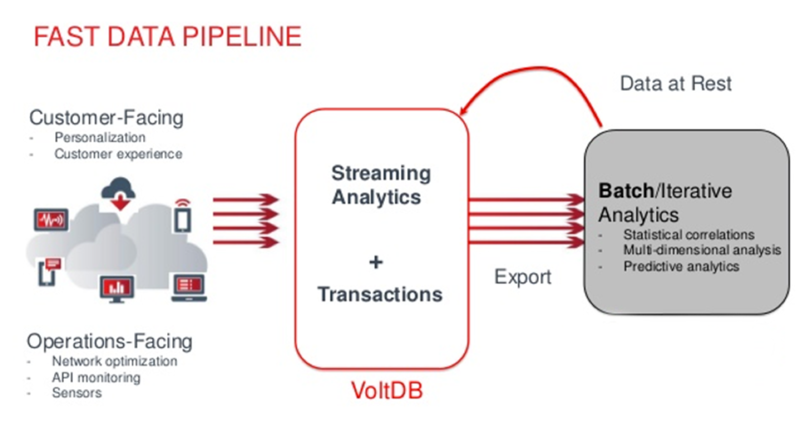 A term used often by VoltDB, fast data pipelines are a new modern breed of applications — applications that combine streaming, or “fast data,” tightly with big data. The first thing to notice is that there is a tight coupling of fast and big, although they are separate systems. They have to be, at least at scale. The database system designed to work with millions of event decisions per second is wholly different from the system designed to hold petabytes of data and generate machine learning (ML) models. Ingest/interact with the data feed in real-time. Make decisions on each event in the feed in real-time. Provide visibility into fast-moving data with real-time analytics. Seamlessly integrate into the systems designed to store big data. Ability to deliver analytic results (mined “knowledge”) from the big data systems quickly to the decision engine, closing the data loop. This mined knowledge can be used to inform per event decisions. Hundreds of fast data pipeline applications have been built and deployed using VoltDB as the fast operational database (the glue) between fast and big. These applications provide real-time decisioning engines in financial fraud detection, digital ad tech optimization, electric smart grid, mobile gaming and IoT industries, among others. This blog is going to drill into how to implement a specific portion of this fast data pipeline, namely the last bullet: The ability to close the data loop, taking knowledge from a big data system and applying this knowledge, online, to the real-time decision engine (VoltDB). “Per-event decisioning” means that an action is computed for each incoming event (each transaction). Usually, some set of facts informs the decision, often computed from historical data. These “facts” could be captured in machine learning models or consist of a set of generated rules to be executed on each incoming event. Or, these facts could be represented as rows in a database table and used to filter and generate optimized decisions for each event. This blog post will focus on the latter: storing and updating facts represented in database tables. When storing facts in database tables, each row corresponds to some bit of intelligence for a particular value or set of values. For example, the facts might be a pricing table for airline flights, where each row corresponds to a route and service level. Or the values might be a list of demographic segmentation buckets (median income, marital status, etc.) for browser cookies or device IDs, used to serve up demographic-specific ads. Fact tables are application-specific, can be simple or sophisticated, and are often computed from a historical “big data” data set such as Spark, Hadoop, or commercial data warehouse, etc. Fact tables can often be quite large and can be frequently recomputed, perhaps weekly, daily, or even hourly. It is often important that the set of facts changes atomically. In other words, if airline prices are changing for ten’s of thousands of flights, all the prices should change all at once, instantly. It is unacceptable that some transactions reference older prices and some newer prices during the period of time it takes to load millions of rows of new data. This problem can be challenging when dealing with large fact tables, as transactionally changing millions of values in can be a slow, blocking operation. Locking a table, thus blocking ongoing operations, is unacceptable when your application is processing hundreds of thousands of transactions per second. Create an exact copy of your fact table schema, giving it a different name — perhaps Facts_Table and Facts_Table_2. Make sure the schemas are indeed identical (and neither is the source of a view). While your application is running (and consulting rows in Facts_Table to make decisions), populate Facts_Table_2with your new set of data that you wish future transactions to consult. This table can be populated as slowly (or as quickly) as you like, perhaps over the course of a day. When your Facts_Table_2 is populated and you are ready to make it “live” in your application, call the VoltDB system procedure @SwapTables. This operation essentially switches the data for the table by swapping internal memory pointers. As such, it executes in single to a sub-millisecond range. At this point, all the data that was in Facts_Table_2 is now in Facts_Table, and the old data in Facts_Table now resides in Facts_Table_2.You may consider truncating Facts_Table_2 in preparation for your next refresh of facts (and to reduce your memory footprint). Let’s look at a contrived example using the VoltDB Voter sample application, a simple simulation of an American Idol voting system. Let’s assume that each day, you are going to feature different contestants for whom callers can vote. Voting needs to occur 24×7, each day, with new contestants. The contestants change every day at midnight. We don’t want any downtime — no maintenance window, for example — when changing our contestant list. The schemas are identical, and this table is not the source of a materialized view. Apologies to those not New England-based! As you might have guessed, VoltDB’s headquarters are based just outside of Boston, Massachusetts!